The acoustical concept of the Installation "SPECTRUM" ist based on the duality of major and minor in the relative key of a sole string-tenuto four-note chord. The ambiguous auditive perception, achieved by a certain inversion of the extended three-note chord, is intensified by the abondonment of melody and rythm. The timbre and perception are influenced by the acoustical properties of the space and the amplification system. The position of the recipients in space or of his/her mood affect the perception additionally. A quasi synesthesian relation exists between the sound and the colors of the projection. 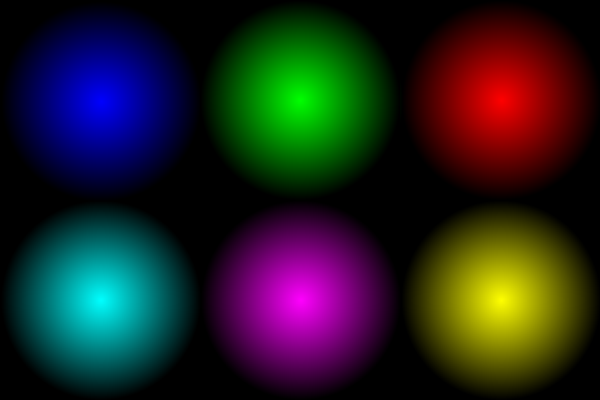 The circular brightness gradient leaves the conture undefined, the colors are continuously changing. The projektion as the only illuminant and orientation point modifies the perception of the space, and causes because of the persistense of the vision autokinetic effects with complementary colors.